What you’ll get from this page: Timeline provides real-time scrubbing and nonlinear editing (NLE) workflows. You can create dynamic shots using procedural cameras, and your own tracks and clips; blend and extend clips, repeat tracks, and control practically anything in your game from the multitrack interface. Timeline was built to enable users to quickly assemble assets in an intuitive, frame-based environment. Using Unity’s drag and drop behaviours, users can easily bind Game Objects to different types of tracks by dragging them directly into Timeline. Assets such as audio and animation clips can also be dragged to timeline tracks to be assembled visually, in time. New animations can be keyframed in context much in the same way as one would in the Animation Window. Clips can then be trimmed, moved and sliced until the sequence is “just right”. The ability to scrub newly assembled timelines allows users to judge visually how the different elements interact with one another and make necessary changes on the fly. 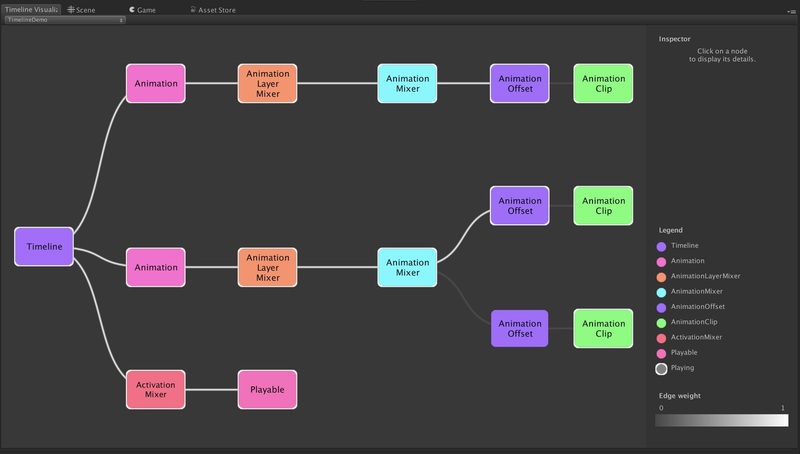 Timeline is built on the Playable API (the same system as animation) and includes an integration for Cinemachine. Cinemachine is a modular suite of professional camera tools, written in C#, that provides access to camera control at a AAA game level, for every camera in your project. Script playables (these used to be the custom animation playable). They’re playables written in C#. So, if you want to have your own type of playable–have something happen while the graph’s evaluated–you’ll be able to write it in C#. Playable assets: These are serializable objects that can inject playables into a graph. Playable assets are in fact the core feature we’ve built Timeline on: Timeline assets themselves are playable assets, that is, assets that generate a tree. And tracks and clips are also playable assets and they all do their work of injecting to build a larger tree. In fact, the Cinemachine Timeline integration is built completely as user scripts using the same Playable API. Because a Timeline generates a Playable Graph, it can be played back with no performance penalty. Timeline will play animations, audio and script as efficient as the native systems, letting you use Timeline in various ways throughout your game. Use it to smoothly transition from gameplay to cutscenes, create complex visual effects, create ambient sequences, or use it together with cinemachine to create cinematic quality cameras. This expert session from Unite dives deep into customization, experimentation, and complex use-cases that leverage Unity's cinematic and post-processing tools for games and film. Brand new features will also be covered, such as the Impulse Camera-Shake system, the Event module, and ClearShot improvements. Read this blog by Unity evangelist Ciro Continisio post to find out about how Timeline can drive dialogues, support branching, or even connect with the AI systems of your game. Another great in-depth blog from Ciro, this time on creative scripting for Timeline. Ciro instructs you in how to leverage Timeline to blend gameplay and storytelling, to bring your content to the next level.